Home / Politics / Buhari wants Lawan to take over from Saraki, Gbajabiamila As Reps Speaker? Buhari wants Lawan to take over from Saraki, Gbajabiamila As Reps Speaker? 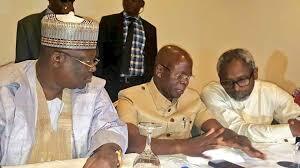 Who takes over from Senate president Bukola Saraki at the end of 8th Senate? The race is on, those who have what it takes are positioning themselves to get the support of the PDP if the APC refused. But President Buhari has given the nod to Ahmad Lawan as senate president and Femi Gbajabiamila as the speaker of the house of representatives in the in-coming national assembly. Recall that both men, who are currently the leaders of the APC caucus in the upper and lower chambers of the national assembly, enjoyed the support of the president in 2015 but Senate President Bukola Saraki and Yakubu Dogara, speaker of the house of reps, teamed up with some Peoples Democratic Party (PDP) lawmakers to edge them out. While Lawan did not get the opportunity to go head-to-head with Saraki, Gbajabiamila lost to Dogara. However, Saraki is out of the way, having left the APC for the PDP and lost his re-election bid. Dogara is also not expected to put a fight as PDP, his new party, does not have enough numbers in the house of reps.
TheCable reports that Buhari favours Lawan and Gbajafor the top jobs. APC has 25 seats more than PDP in the senate while the ruling party is clearly ahead of PDP by 100 seats in the green chamber. 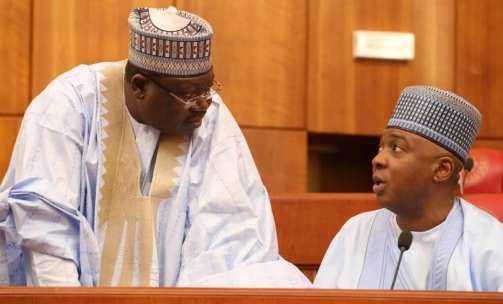 Last week when he announced his ambition to lead the senate, Lawan, who represents Yobe north, said the ruling party will do things differently in choosing the leadership of the 9th national assembly because it had learnt its lessons in 2015. “We are not in any way thinking that we will have crises; it is not what we are envisaging at all. But let me say that our party, the APC, must have learnt its lessons, and therefore, the party leadership will do something differently this time,” he had said at a press conference in Abuja. Senator Lawan was elected into the house of representatives in 1999 and got into the senate in 2007. On his part, Gbajabiamila, who represents Surulere 1 federal constituency of Lagos state, is an ally of Bola Tinubu, a national leader of the APC. He was first elected into the green chamber in 2003. Copyright© DailyGgist. 2017 - 2019. Powered by Blogger.